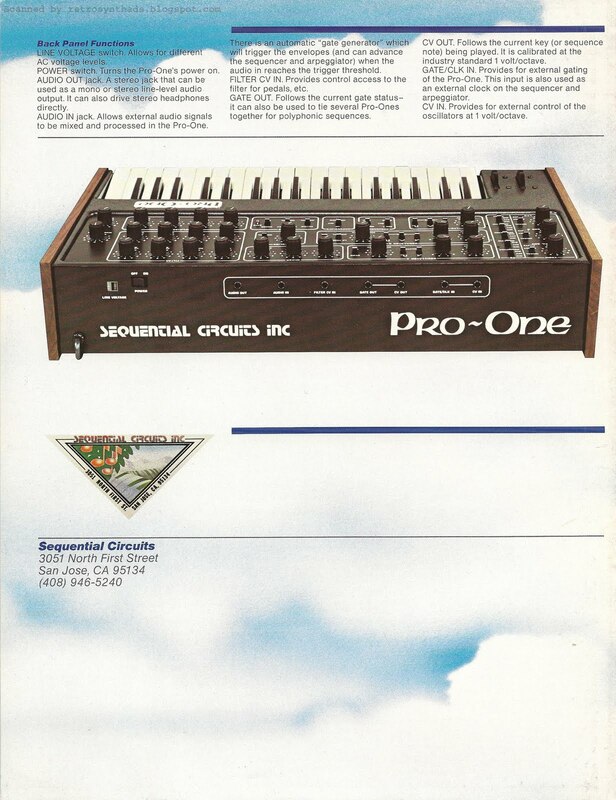 Sequential Circuits Inc. Pro-One 4-page Spec Sheet from early 1981. Update: Added to the Sequential Circuits advertising timeline tool. Well - we are headed into the August long weekend. And you know what that means... shorter blog posts! It's just too nice out to be blogging much. Gah! This makes it tough for me to not only keep the blog post short, but to say anything bad about the company, or any of SCI's gear - in particular the Pro-One. Luckily, its very rare that I find something to complain about when it comes to SCI. And its usually something very trivial. This brochure is a perfect example of that. Putting the interesting choice of front cover images aside for a second, the only thing I can really fault this brochure for is that there is no date stamp anywhere. And really, how would SCI know I would be looking for it 30 years later? Other companies like Roland are great for date stamps on their brochures and other printed material. They often included the year as well as the MONTH (!) - as can be found on the back of these brochures for the TL-12, this 808/606/303 rhythm machines and SH-101. But SCI... not so good. Luckily, SCI has some pretty distinct and consistent advertising periods, so spec sheets like this one are usually easy to date without resorting to carbon dating or some other costly scientific method that might destroy the test material. Just look at the advertising for the Pro-One over time and I'm sure you can pick out when this brochure was probably designed. Yeah, I'm probably thinking what you are thinking. Based on these ads, this brochure was no doubt created relatively early on in the Pro-One's life cycle - ie: early 1981. And that would make sense, since a spec sheet would usually be created when a new synth was first introduced, or after a significant update to the design. So, back to the spec sheet itself. One word - gorgeous. Kick's the butts of the reference sheets of most other companies. In fact, the design of the piece actually makes it feel more like a brochure, so I've included that label for this post as well. About that front page for a sec. Somehow it just doesn't look that balanced. I can see why they've chosen those three view points for the photos of the Pro-One. Front view, angled view, and kind of a side view. But, that last photo doesn't really provide much more visual info that can't be found in the angled view. 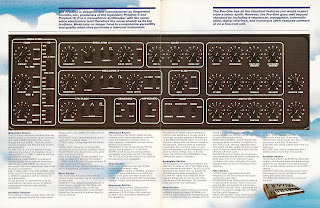 But all is forgiven when you turn the page to view that gorgeous full two-page spread of the Pro-One's control panel. Honestly - how beautiful is that. And below readers find all the juicy specs. You just can't beat it. And, what I find best of all - in the top right corner of the inside pages, SCI mentions the digital interface. I've always been fascinated with this addition to the Pro-One. Excellent! You can find out more about this feature in most online manuals. The back page doesn't disappoint either. You can see all back panel connections clearly, and the logo on the back with the quarter notes in the trees and the keyboard key's wrapping around the hilly cropland, also help date the spec sheet to the same period as that early 1980's advertisement that also sports that same logo. Also, note that only the top half of the back page contains technical information. The only info on the bottom half is the return address - meaning that this piece was obviously meant to be folded in half for easy mailing. Efficient. Like I said - gonna keep 'er short. And almost did! Time to enjoy the outdoors. Doesn't last long here. 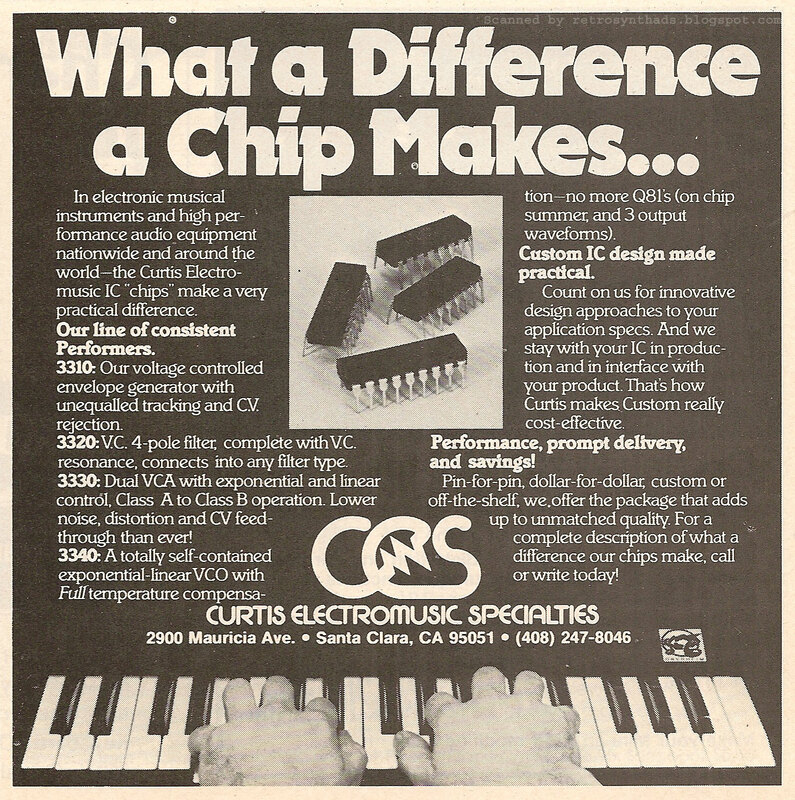 Curtis Electromusic Specialties "What a Difference a Chip Makes" 1/4-page advertisement on page 71 in Contemporary Keyboard February 1980. This rare advertisement only seems to have found its way into CK a couple of times. But ain't it the truth: what a difference a chip *does* make. Curtis chips have reached epic status in the vintage synthesizer world. 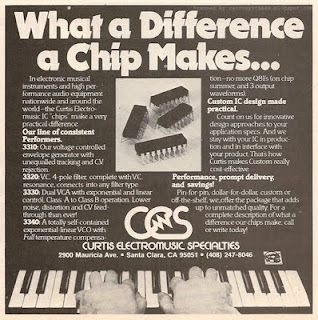 Most electronic musicians with a soft spot for retro hardware have heard of the chips, although I bet very few knew the full name of the manufacturer "Curtis Electromusic Specialties". I sure didn't know it before coming across this ad later in life. But, as much as I love this ad, the real question is - how effective can it be for a chip maker to advertise in Contemporary Keyboard, or any other electronic musician-based magazine? 1. 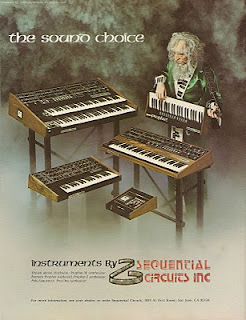 Marketing the Curtis brand to synthesizer companies. Contemporary Keyboard was probably read by both small and large synthesizer manufacturers - so it could have been one way for CES to reach this audience. But I would think there had to have been better ways to get your message into engineers' offices. 2. Marketing the Curtis brand to synth buyers. By raising electronic musicians' awareness of, and the quality of, Curtis chips in gear, Curtis could potentially raise consumer demand for synthesizers with Curtis chips, so synth manufacturers would then design and build more synthesizers with Curtis chips. Kinda like Columbian coffee growers' Juan Valdez promotions, or probably a better example is Nutrisweet promoting its sweetener in consumer food magazines. I would assume to raise awareness of the brand so that in the end consumers will buy more products from manufacturers that contain Nutrisweet or Columbian coffee. Hmmm - maybe those aren't perfect examples... I'll keep thinking. But you get the idea. But based on the ad-copy alone, it looks like Curtis decided to take aim directly at synth companies and those brainiac engineers. I consider myself a 7-out-of-10 when it comes to the innards of vintage synthesizers, but I have no idea what "C.V. rejection" is. And I doubt most other readers of CK would either. "Class A and Class B operation"? No clue on those either. In the end, history has shown that it took more than a few ads to give CES and Doug Curtis the profile rightly deserved. In fact, its taken decades of legendary synths, vast word-of-mouth, kind words from other synth visionaries like Dave Smith, and a large active world-wide vintage synth community. The company Curtis Electromusic Specialties was founded in 1979 by Doug Curtis and continued operations until 1988, when it became OnChip Systems. You can find the full history of the company on the awesome Curtis Electromusic Web site. The site looks to have been created around 2007 by his wife Mary (mcurtis@ is listed as the email address in the contact section). The site includes some great reference information, including company history, datasheet PDFs, and a growing list of synthesizers that used the chips. The site also includes a great page on Doug Curtis himself. And as soon as I read the last paragraph concerning his battle with cancer, I was immediately taken back to 2007. I distinctly remember reading about it in Keyboard. I hadn't picked up Keyboard Magazine for a while, and recall flipping through a friend's April 2007 issue when I came across a tribute article on Doug written by Marcus Ryle. It also included two paragraphs written by Dave Smith, where he recalls starting his working relationship with Doug while redesigning the Prophet-5. That one-page tribute alone is a great reason to pick up a copy off eBay if you can find it. There are a number of other CES resources on the Web as well - especially those with datasheet PDFs. Google away. Two that stand out for me are Synthtech.com, which has a CEM page including datasheets, and where you can also purchase chips on the site. The Curtis CEM Wikipedia page also has a bit of info, and gives Doug the title "Father of the Analog Synthesis Chips". And a great name for a band. Class A and Class B amplifiers: It sounds like Class A amplifiers are simple, but inefficient amplifiers, while Class B amplifiers create a large amount of distortion but efficiency is greatly improved. See Wikipedia page for more info. Q81: Resistor used to compensate for scale drift in VCAs. CEM3340 VCO didn't need 'em. On chip summer: Sum-of-2-products computation for all controlling parameters done on the chip. Almost understand this. I think two or three years of engineering school would help. 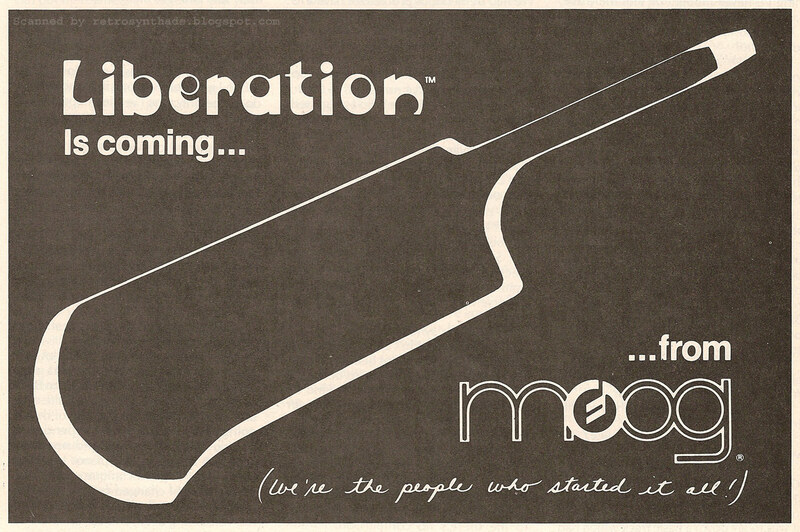 Moog Liberation pre-launch 1/2-page advertisement from page 52 in Contemporary Keyboard June 1980. 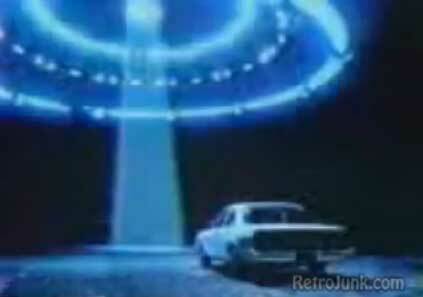 Update: added to the Moog interactive advertising timeline. I've come to love pre-launch advertisements. The Sequential Circuits Pro-One series of pre-launch ads were simple but fun, and the Korg Sigma pre-launch ad was just gorgeous looking. Pre-launch ads usually just run in one issue, and I'll never think one month of advertising is enough for a magazine audience in the 70s or 80s, but I can't deny their appeal. I love them so much I've created a new blog label called "pre-launch". And the Liberation's simple but effective pre-launch advertisement doesn't disappoint either. I can't help but compare it to Moog's earlier Minimoog "KISS" (Keep It Simple, Stupid) ads - this September 1979 "When you've got the sound" colour ad, and this July 1979 "You know what this is" black and white ad (it doesn't even include a logo!). Simple. Effective. This time, its the outline of the Liberation that is the focus of the ad. And any keyboardist even remotely (no pun intended) familiar with some of the more recognizable custom "keytar" instruments that had already been developed and played by Powell and others, would know what type of instrument Moog was about to launch. But, I wonder how good Moog was at keeping the actual specs of the Liberation a secret. I would have to think that prior to the Internet... pretty good. And of course, if you want photos, look no further than a Google Images Search. And, really, all you need is this rather recent June 2011 MATRIXSYNTH auction post. It includes a wack of great close-up colour photos of the instrument, front panel and back. Just look at the shiny flashes of color on those controls! Lots more photos of other Liberations on MATRIXSYNTH too. Wait a tick! 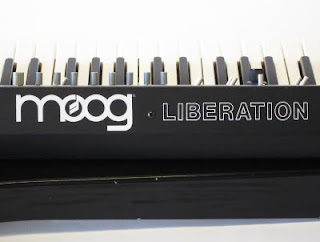 I just noticed something that I had never clued into before... the logo-type font on the back of the Liberation in that MATRIXSYNTH auction post looks *nothing* like the Liberation logo-type font used for the word "Liberation" in this pre-launch ad or the Tom Schuman "Treat Yourself to FREEDOM" ad. Here's a good photo of the back on the Liberation from that MATRIXSYNTH post. 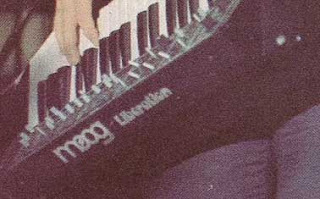 But, even more interesting - Tom's Liberation definitely has that 60's style logo-type on the back panel - not that typical Moogy-looking font. I did a quick scan through Google Images, and can't find a photo of a Liberation with the 60's style logo. Either Tom is playing a pre-production model or there are a few rare production Liberations with the old 60's style logo-type floating around out there. Either way - Boo to the change! The Liberation was meant to be a fun instrument. And a fun instrument should have a fun 60's style logo! They should have kept it. If you've seen one of these special Liberations (or own one! ), please let me know. End note: I just realized why exactly I get a little confused by Tom Schuman's photo in that other Liberation ad. He really does remind me of that guy from one of my favorite early 80's shows when I was a kid "The Greatest American Hero" - William Kat. 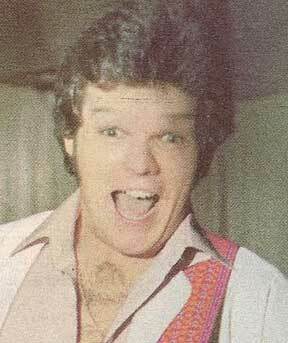 I think Tom just needs to trade in the feathered hair for a perm. Look familiar? Remember that Syntar brochure cover...? Hmmm. I'm starting to see connections everywhere. Moog Liberation 1-page advertisement from page 43 in Contemporary Keyboard July 1980. Let's face it - 1980 was the year of the Keytar. Sure, independent designs and ideas started popping up years earlier, but it was around 1980 when the gates really opened in respect to advertising and promotion. Just how popular? Flip the page this ad appears on and you see a large photo of Roger Powell playing his custom-designed Probe (which, I still maintain is an awful name for a car, keyboard or anything for that matter). 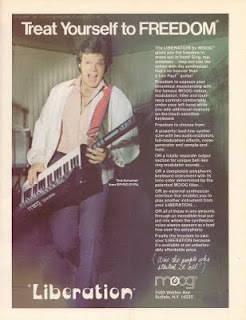 And earlier is this issue is another keytar manufacturer's ad. Two keytars are top-of-mind for me, and probably for most keytar history buffs, when 1980 is mentioned: George Mattson's (of Mattson Mini Modular fame) wicked looking Syntar, and of course, Moog's very... er... Moogy-looking... Liberation. Jump forward more than thirty years later, and we somehow get to a point where this advertisement has become almost as iconic as the Liberation itself. You see it everywhere. e-Bay auctions. Scans online. It's probably safety-pinned on to the back of someone's satin jacket somewhere in the world. For me, this ad has both a lil' bit o' good and bad in it. No, seriously - since first coming across this advertisement, that open-mouthed look on Tom Shuman's face has been permanently burned into my cranium. And the chest hair doesn't help either. What was it with Moog and body hair back in the day?!?! 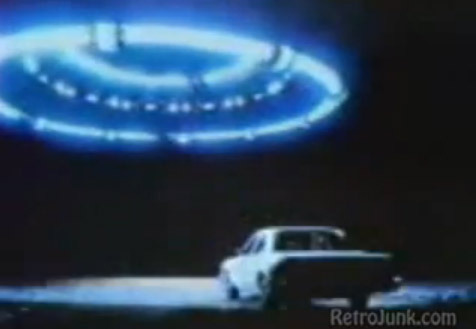 With regards to the Liberation, Moog really did use every vehicle possible to promote it. Magazine advertisements and promotional literature, NAMM promotions with the Liberation strapped around a mannequin (page 36 in Vintage Synthesizers by Mark Vail), and of course, their Moog Interface newsletter. In the September 1980 newsletter (fresh back from Chicago's NAMM show), The Liberation makes multiple appearances, including the big front page article that introduces readers to the technical aspects of the keyboard, including a nice line drawing of the front panel. 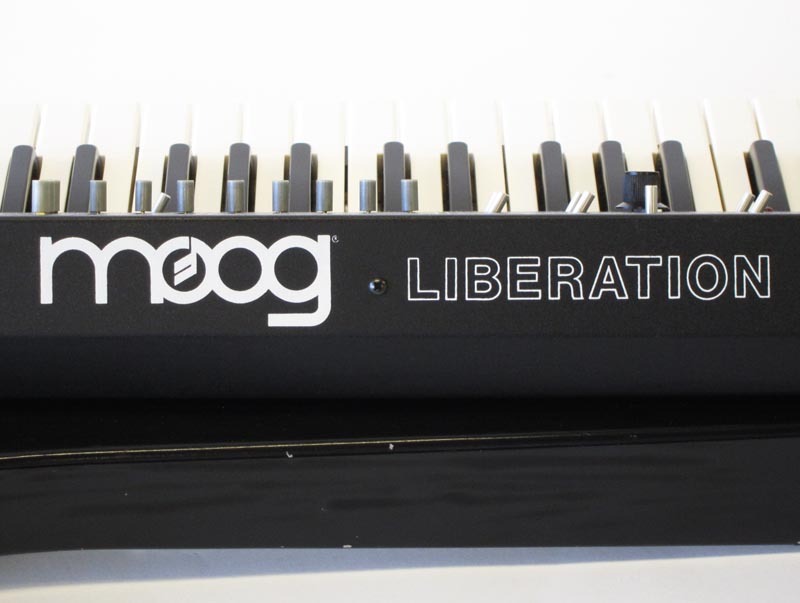 Interestingly, Moog also mentions that "the Liberation is definitely a performance oriented instrument although it will lay flat on top of other keyboards". What? Why dirty the waters? This thing is meant to play over the shoulder. Stay on message! Stay on message! In addition, page 2 has a photo of DEVO playing Liberations, as well as a mention for "Moog Mobile Wizard" Tom Schuman (star of this ad) and another mention of Liberation user Ronnie Foster. And page 3 has a photo of The Motel's keyboardist Marty Jourard in the Moog factory with a Liberation leaning against a Moog Modular. 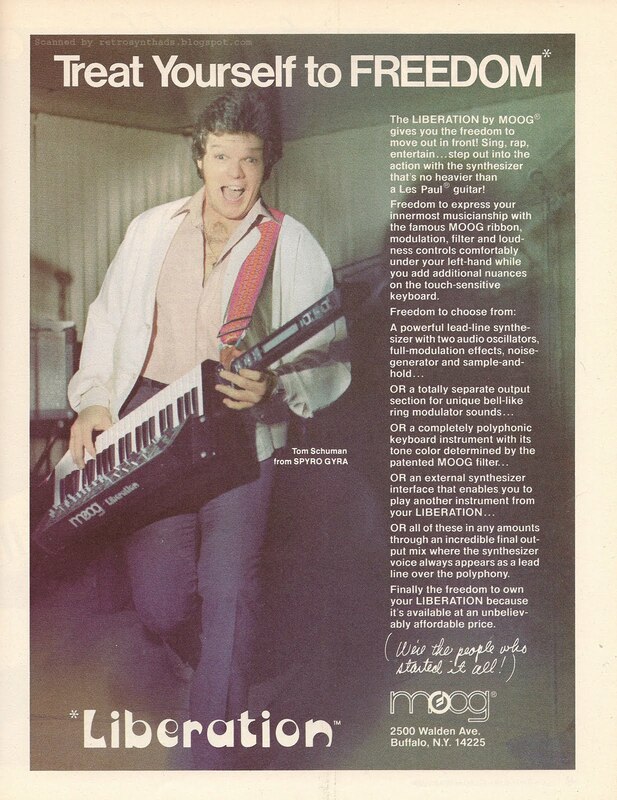 Moog keeps the promos going in the December 1980 newsletter with a photo of Ronnie Milsap and a mention that he is on tour with the Liberation on page one. Page two has a question asking which Bob in DEVO is playing the Liberation on their appearance on Midnight Special (answer: Bob 2). Page 3 has a photo of two member's of Kenny Roger's group playing Liberations. With a lot of this promotion occurring within a three month period, it's safe to say that awareness of the Liberation was a success. 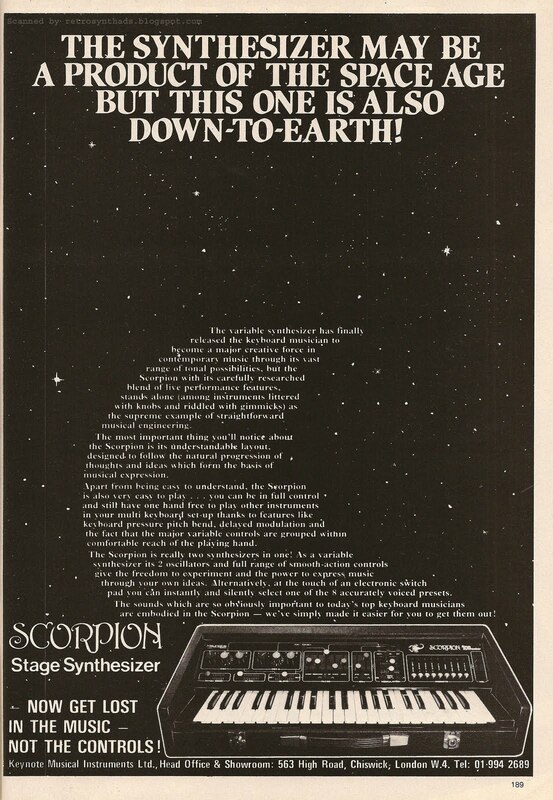 Part 2: Keynote Musical Instruments Ltd. Scorpion Stage Synthesizer ad: Technical synth info! Part 2: Keynote Musical Instruments Ltd. Scorpion Stage Synthesizer 1-page advertisement - technical specs! I got a little sidetracked in my original Scorpion Stage Synthesizer blog post, so I thought I would try this again. 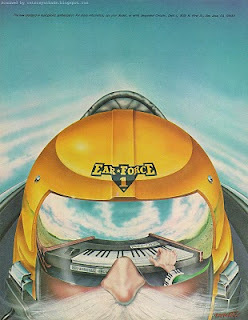 And this time I promise to try and stay focused on the ad and the synth's technical information (and it almost works!). The ad itself isn't anything out of the ordinary. Between the verbal diarrhea, the size of the font, and the curved shape of the ad-copy itself, the ad is a little hard to read. But I'll let that slide since they were such a small company and yet still managed to come up with such a cool logo. Check out the full logo with the scorpion image on the photo of the synth itself. 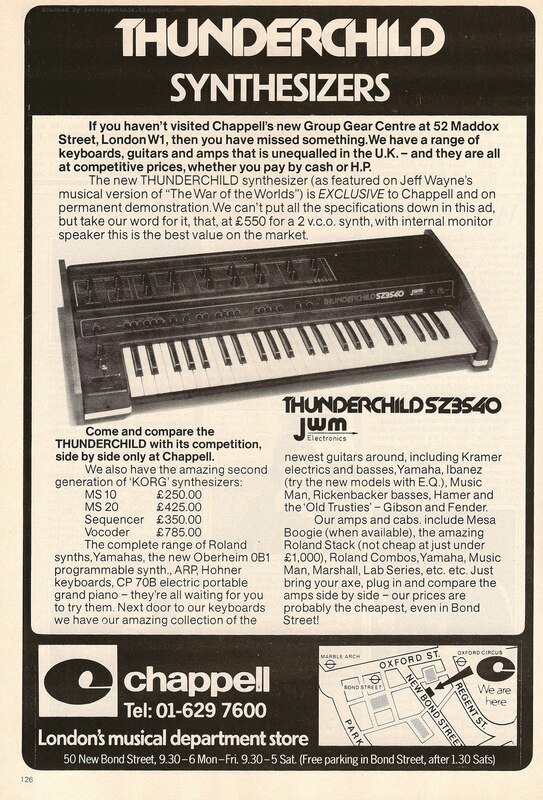 Unlike the Thunderchild synth which I recently blogged about, I had actually heard a little bit about the Scorpion Stage Synthesizer years before, probably through rec.music.makers.synth or Analogue Heaven or some other discussion list, most of which could also be found in this ad. But, outside of what is found in this ad, I hadn't come across very much technical information about this synthesizer online. 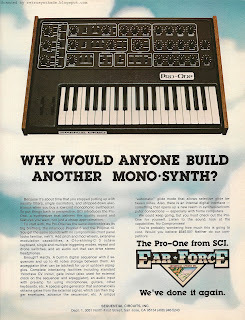 So, you can understand just how excited I became when I came to the realization that the same issue of the magazine that introduced this ad, also included a "Synthcheck" on the Scorpion Stage Synthesizer. For those not familiar with IMRW, "Synthcheck" is the equivalent of Keyboard Magazine's Keyboard Review. "The Scorpion is being advertised as the first British lead line synthesizer. It is not the first British synthesizer by any means but, as far as I know, it is the only one that has been introduced to compete with the smaller stage synthesizers like the Micro Moog, Arp Axxe, etc. 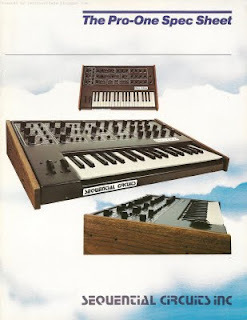 It is simple to understand, easy to operate synth, aimed at the person who has been frightened off using a variable synthesizer because of his/her lack of understanding of synth jargon and technical terms (the owner's manual contains information on not only how to operate the synthesizer, but also how the different parts of the synthesizer affect the final sound.)" VCO 2 signal can be switched into the control input of the filter producing "interesting distortion and ring modulation effects"
Oscillator footage NOT remembered - for example the flute pre-set will sound too low if pressed while playing oscillators at 32"
"The synthesizer I was given to review performed well with no evidence of drift. I was particularly impressed by the sound of the instrument. It sounded a lot like a Mini-Moog (which can't be bad). the pre-set sounds were full and rich and reasonably realistic, and the sounds chosen seem to be the most useful when you are limited to eight." Sounded like a Minimoog? Really? Huh. Anyone confirm this? Anyone...? Anyone...? Bueller...? So, who is this Dave Simmons that had the balls to compare the Scorpion to the Minimoog - even back in 1978? I thought I would do a little search to see if I could find anything. General name searches didn't help much and results for "Dave Simmons" + [insert selected musical/synth terms] was also rather unsuccessful. But, then I remembered that at the end of the review article, there was a short bio for Dave which included the fact that he played "the massive synthesizer part in Dave Bedford's 'Odyssey'." Most of the search results for Dave Bedford's Odyssey link to online music resource pages like this one at proarchives.com. And most list Dave Bedford as playing most of the keyboards (check out the other artists listed!). "Dave Simmonds (Fad Gadget?) - string synthesizer"
And, later in the discussion, the name is corrected to Dave Simmons. So, does the poster mean it was corrected to be Dave Simmons from Fad Gadget? Or corrected to be a totally different Dave Simmons that has nothing to do with Fad Gadget? I figured I could simply Google Fad Gadget and look up the list of band members, but quickly ran into problems. Always end on a high note - so here's Fad Gadget's Collapsing New People vid. Enjoy! Keynote Musical Instruments Ltd. Scorpion Stage Synthesizer 1-page advertisement from page 189 in International Musician and Recording World December 1978 (UK). While I was researching my recent blog post on the the Thunderchild synthesizer, I came across a PDF of a FutureMusic article with photos of a wack of rare synthesizers. 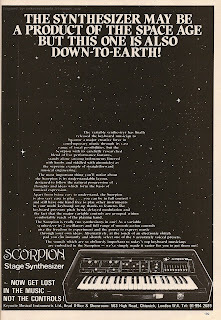 My eyes were instantly drawn to the photo of the Scorpion Stage Synthesizer, and I figured that was good ol' Fate telling me it was time to blog about this ad. Almost as soon as I started Googlin', I came across something unexpected. One of the top search results from Google led me to the Wikipedia discussion page for the Keytar page itself. It seems that in October 2009, one contributing member provided some great historical information both on the Scorpion Stage Synthesizer and KMI, while referencing the fact that KMI had invented the Keytar in the late 1970s. I hadn't heard this angle on Keytar development before - and it seems to be a rather current addition to online Keytar history (at least to me), so I thought I would take a bit of a detour and do a bit of investigation before getting back to blogging. ...The Keytar concept came about as a consequence of Jeremy including an extra voltage-control jack-socket on the back panel of the Scorpion Stage Synth to enable a remote keyboard to run the synthesizer from elsewhere on stage. This then led to a vigorous discussion within the KMI team about the potential for making this remote keyboard into a self-contained shoulder-hung live performance accessory.... The name ‘Keytar’ took only a few days to materialise after the initial idea had been hammered out within Keynote and substantial funding was then devoted to obtaining international trade-mark protection through registration of the Keytar name." Unfortunately, we don't really find out how the author is "deeply involved with the company", but another post on absoluteastronomy.com provides more information. "It was only one more logical step until I also included the idea of a guitar-type neck in which would house the 'expressive' electronics such as a slide potentiometer for the pitch bender and it became obvious that this was a keyboard worn like a guitar and so should be name The Keytar. Rick Wakeman was a good friend at the time and helped us with the first test runs of the earliest unit we produced which was, in fact, a floor board with a keyboard unit screwed onto it and a Guitar neck which I purchased from a local company called Chandler Guitars in Kew, West London. To see if it would work in practice rather than just as an idea we routed out a space in the neck to house the slide potentiometer and added a guitar strap to complete the idea. According to the post, Rick Wakeman demo'd the unit publicly at the 1978 Frankfurt Trade Fair, but for financial reasons, KMI didn't get a patent, and the idea ended up being copied by other instrument companies. The author does claim that KMI did protect the name "Keytar", but when protection ran out, another company used it for the name of a toy version of the keytar that they developed. A follow up post challenges the author to prove these claims, but unfortunately there has been no further posts in the discussion. As tends to happen with the InterWebz, once information is online, it starts to spread. And that seems to be what happened when a February 2010 article on the Keytar showed up on the Guardian's Web site. 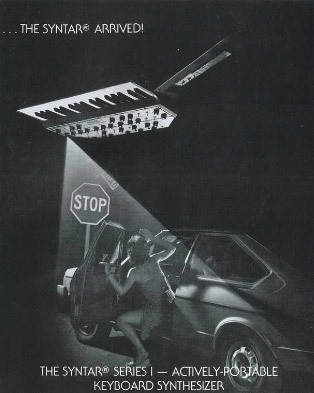 "The brainwave for the keytar came to cottage industry entrepreneur Lesley Symons in 1977, after her brother Jeremy – a colleague of Robert Moog – invented a synth with a controller output for external keyboards. Seeing Beatles organist Billy Preston perform with a whole Fender Rhodes around his neck, Lesley figured that a lightweight, strap-mounted keyboard, with a guitar-type neck for pitch-bend functions would be a popular controller." "Lesley Symons actually patented the keytar name, prior to unsuccessfully pitching the concept to Roland. This means that "Keytar" is like Hoover, Sellotape or Tipp-Ex – a byword for all generic products of that form when it should just be a specific brand name. Although the derivative Roland, Yamaha and Casio designs would out-perform Lesley's own Keynote Musical Instruments products, they were unable to use the description "keytar" until the copyright protection expired in the 1990s." After reading over this blog post so far - I'm not really sure what the point of all this writing was. At first its main purpose was to distill out the Scorpion and KMI information from the posts I found online, but at some point it turned into a short Keytar/KMI info-gathering mission. One that just happens to include info about KMI and the Scorpion too. And maybe, on some unconscious level, looking for more evidence about this connection. The company first marketed a portable organ called The Keynote Consort, and created a line of "Leslie-type" organ tone cabinets to accompany it, called The Vortex. JWM Electronics Thunderchild 1-page advertisement from page 126 in International Musician and Recording World Magazine November 1978 (UK) . There are just so many wonderfully different synthesizer ads in early International Musician and Recording World, and this is a good example of one of those ads that comes with some great history attached. In fact, this synth has almost reached mythical status. And I never even knew it existed until years later when I opened the pages of this magazine. 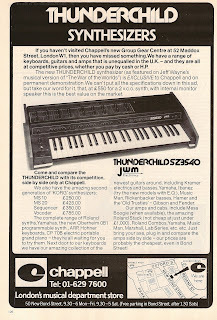 According to this ad, JWM Electronics' Thunderchild synthesizer was the keyboard "featured on Jeff Wayne's musical version of 'The War of the Worlds'". And Chappell, a London music department store, apparently had exclusive sales rights to it. This was all news to me. And after just a bit of Google searching, I'm almost embarrassed about my lack of knowledge. First, who the heck is Jeff Wayne? Turns out you can find out everything you need to know about him on his Wikipedia page. And, as you will read, he's kind of a big deal - creator of over 3,000 advertising jingles and a wack of television themes and film scores, a musical director, and an author. Nice resume. "Jeff Wayne's Musical Version of The War of the Worlds is a 1978 concept album by Jeff Wayne, retelling the story of The War of the Worlds by H. G. Wells. Its format is progressive rock and string orchestra, using narration and leitmotifs to carry the story via rhyming melodic lyrics that express the feelings of the various characters. The two-disc album remains a bestseller, having sold millions of records around the world. It has since spawned multiple versions of the album, a computer game, a DVD, and a 30th anniversary live tour." In addition, the thing spent 290 weeks in the UK album charts, and reached #1 in 11 countries. What? Seriously? I have to ask again - how could this phenomenon have escaped my obsessed teenage music exploration entirely? Thankfully, there is a Web site that was created specifically to catch me up on all things musical + War of the Worlds. The site contains tons of information on recent tours, news, and, of special interest to me - an Archive section. It includes a newspaper cutting with information directly related to this advertisement, explaining that Chappell Music would have exclusive sales rights for only the first two months before it went on general sale throughout the UK. Jeff Wayne is also quoted in the article, stating that "It's got everything that a £1,100 instrument has got, but Thunderchild will be selling for half the price. It's just got to be a winner". The historical documents section of the Web site also includes some other delicious treats, including what looks to be a very considerate movie deal rejection letter from Steven Spielberg. Mr. Spielberg did finally get around to making a non-musical version of that film, and thankfully, kept Tom Cruise's singing to an absolute minimum. This section is definitely worth spending some time on if you are even remotely a movie nut. Another section of the JWMVOTWOTW site - The Story - contains some great historical facts about the creation of the album and the recording sessions. There's some good nuggets in there, like the little story of how the session musicians chose to take session fees over royalties. Ouch. Well - that's pretty dramatic. For someone like me that had never heard of JWMVOTWOTW until just a short while ago, all the connections between the history of JWMVOTWOTW, the musicians, the composing and recording, and everything else is almost mind-boggling. Will definitely be doing more research when I find the time. What about the synthesizer itself? So, enough about the musical - time to search for info on the synth itself. Turns out there are a few gems online. I found some great quotes on Facebook attributed to Jeff Wayne, where he explains that the Thunderchild "was designed by a young 18-year electronics boffin named Nick Groome who worked at JWM Electronics". After it was used on the musical TWOTW, 6-10 prototypes were created, but in fact the synthesizer "never made it onto the music scene". "I did play it [the Thunderchild] on a few tracks on TWOTW, but none actually survived as Yamaha's CS80, the first poly synth, came out about half-way through TWOTW production, and we replaced many of the original sounds with Yamaha's ground-breaking keyboard, including the famous ribbon controller and finished most of the remaining sounds with it, although the Arp Odyssey, the mini Moog (great for bass sounds) and my Fairlight contributed a bit." You can read the full quote in the discussion board section of the awesomely named "Jeff Wayne's War of the Worlds is BRILLIANT" Facebook page. I found another great interview from 2009 with Jeff Wayne (Moog 3C mentioned - yum!) on Den of Geek. So, are there any Thunderchild prototypes still out there? I found a few during my quick search. A 2006 MATRIXSYNTH post features a photo of one that was gathering dust "in a garage in an undisclosed location somewhere in the uk". 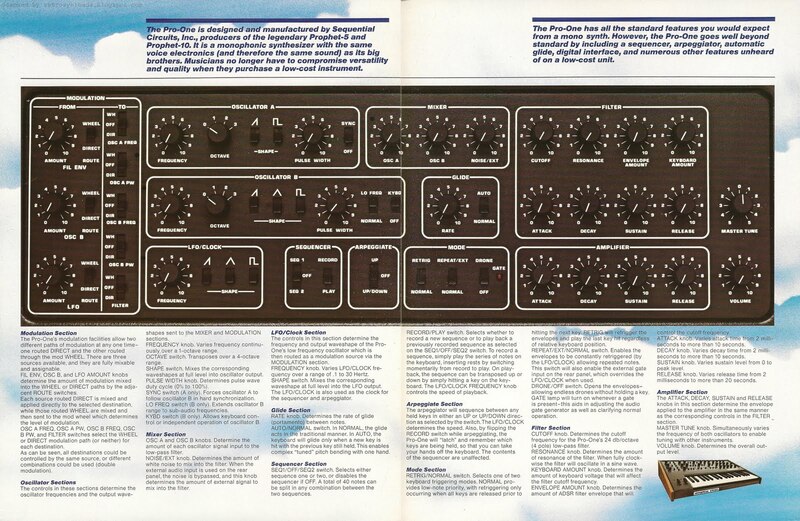 I also found a photo of a Thunderchild in a PDF of a FutureMusic article titled "The collectors". The article is about synth collector Andy Horrell, and includes some great info and photos - including the Thunderchild (page 3). So, now I have a dilemma. I'm a notorious hater of musicals - well except for The 5000 Fingers of Dr. T (written by Dr. Suess and featuring some really wacked-out dancing) and Rocky Horror Picture Show of course. But yet I'm drawn to JWMVOTWOTW like squirrels to nuts. 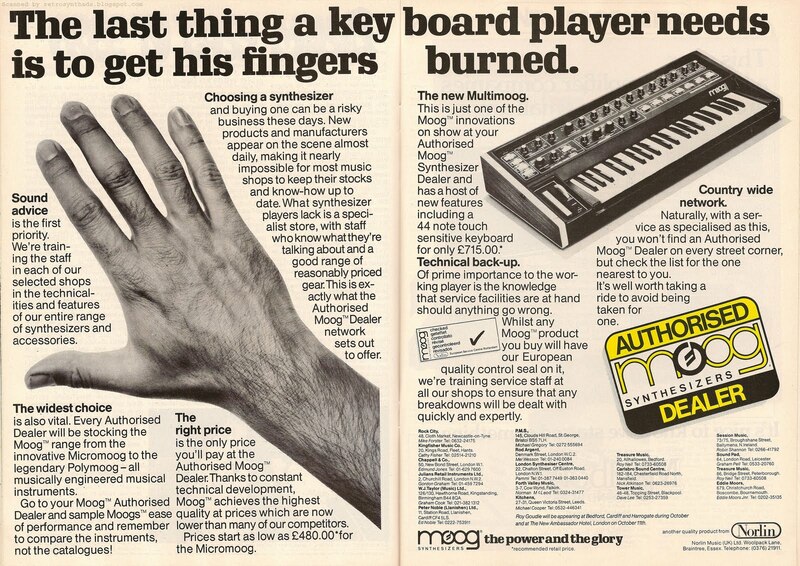 Moog "Fingers Burned" Authorized Moog Synthesizer Dealers 2-page advertisement from pages 98 and 99 in International Musician October 1978 (UK). Friday, July 1 was Canada Day. That makes it a long weekend here in Canada. To make blogging matters worse, it has been really nice out. I mean *really nice*. And lately, where I'm from, this is no doubt a limited time offer. And ain't this Moog dealers ad saaaa-weeeeeeet! There is a lot of historical information packed into this ad - everything from authorized dealer and service info, to the promotion of Moog's new Multimoog. The layout is almost confusing at first, and placing the text such that it wraps around the photos normally doesn't help much. Give me nice clean columns any day. But in the case of this ad, bolded subheadings help package up the information nicely, especially on page one. Here, the headings convey the three key dealership messages Moog is trying to get across to those looking to choose a synthesizer - sound advice and the widest choice at the right price. The second page of the ad gets a little more crazy, where Moog tries to mix some product promo and service tech info in with the dealership stuff. The addition of the product info became even more confusing to me when I read the advert index and found out that Moog included an "8 page loose insert" in this issue, that probably included information on the Multimoog anyways. Unfortunately, loose inserts rarely survive as long as the magazine, so I can't confirm this was the case. But I do know that if they didn't include the Multimoog info in this ad, the added white space probably would have made for a much more enjoyable and organized ad. "Every Authorized Dealer will be stocking..."
We're training service staff at all our shops..."
So, if the way it is written is historically accurate, it looks like we are are witnessing the start of Norlin's organized attempt to expand it's reach into European markets through a dedicated network of dealers and service staff. Neat-o! Another cool piece of reference information is the tag-line used with the logo - "the power and the glory". 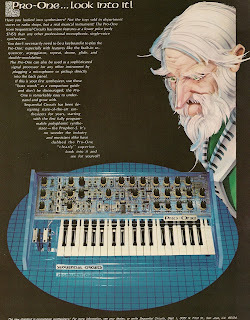 I seem to recall seeing this in some other Moog ads, although I can't put my finger on where, and I couldn't find it in any of the ads I've posted. I'm more familiar with the "people who started it all" or "another quality product from Norlin" tag-lines. When I read this one, my mind immediately connects it to it's religious reference. I guess if anything, it takes balls to try and nick it from the big guy upstairs. I have to say I also dig the "European quality control seal", with the little check mark next to the "checked" in six different languages. How "international" is that?! Surprisingly, this ad is not my favorite highlight in this issue of IMRW. It is actually the cover of the magazine issue itself. In fact, when I first got this magazine, I remember I was a little surprised at what I saw on the front cover, until I remembered this magazine was from 1978. 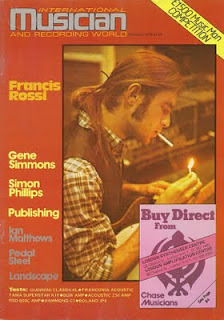 It's a photo of Francis Rossi from Status Quo lighting a cigarette. Yah, you can kind of see he is holding a guitar, but the cigarette and match are definitely the focus of the photo. I find it strange how sensitive I've become to smoking imagery. I see smoking so little in ads and movies now that when it does happen, I'm drawn out of the moment. Together with my ever-decreasing attention span, this has become a problem. For example, I was watching the movie Reality Bites starring my girlfriend Winona Ryder the other day, and reacted to the copious amounts of smoking in that movie in the same way as this cover photo. I was literally pulled out of the movie experience every time a cigarette became visible. In fact, there is so much smoking in that movie that someone should make an anti-smoking drinking game out of it (honestly, I see the irony there, and the increasing problem of addiction in our society). Seriously, though, decades of anti-smoking efforts have ruined this film for me. But at least I still have the My Sharona scene - no smoking there. "As a guitarist and regular reader of International Musician and Recording World, I wish to register my disapproval of the front cover photograph for your October issue (Francis Rossi), which implies that cigarette smoking is fashionable and associated with musical success. I would like to point out that many non-smoking musicians dislike smoke-filled venues, that their health could be at risk through working in such places and that may smoking musicians who want to give up the habit find it more difficult because of the environment in which they perform...."
But that "Smoking makes your teeth yellow/smoking makes your clothes smello" commercial probably is from the 70's, eh? Yah - tried to find that commercial on YouTube... no-go. Anyone find it for me?